Last year, The Bear 100 was my first shot at 100 miles. I trained exceptionally hard and I was well prepared. Finishing in a little over 25 and a half hours was a big accomplishment, but I was confident I had a lot more in me. Like so many ultra-marathoners, I applied for the Hardrock 100 this year, but I didn’t get in. I applied for the Wasatch 100 too, but my name didn’t get drawn either. So, I thought, maybe I still have some more to learn from The Bear 100. I was a little bit unsure of how I was going to pace myself for this years race. I surprisingly only ran up to 50 miles once this year back in June (Zion Traverse), but I had done a ton of really technical and elevation intensive 30-some mile runs. Self-doubt would creep into my brain before the race “have I even ran enough to be prepared for 100 miles?” I quickly cast that crap to the side and decided to just run relaxed, take care of myself, and enjoy the day. After all, it takes a lot of time, money, support from others, time off of work, etc. to do one of these things… you’d be crazy to do this stuff and not have fun. The race starts by a nice park in Logan, with about a mile of running on pavement before the single track starts. As I was running along the pavement I heard a familiar New Zealand accent behind me “Is that Gabe?” It was Anna Frost again, arguably the best female trail runner in the world. As it turned out I ran big chunks of the Telluride Mountain Run and The Rut 50K with her, and now we were paired up again for The Bear. Myself, Anna, and a group of dudes worked our way up the first 4,000 foot climb of the day. We moved fast; it felt pretty easy compared to some of the other climbs I’ve done lately. The descent down to Leathem Hollow was beautiful with clear blue skies and yellow aspen leaves everywhere. I kept singing in my head “follow the aspen leaf road”. I was psyched to see my crew, even if it was just for two minutes. I think the 25-35 mile point of a hundred mile race might be the hardest part. You have been out there a long time, and run a lot of miles, but there is still a really long ways to go. Also, muscle glycogen supplies are pretty much toast at that point, and that’s what most people call “hitting the wall”. Around that time it started getting pretty warm out too. This years race was well above average temperatures for the area, and I was starting to feel it. I often struggle with the heat, so I was determined to not let it get to me. I put on my white running hat, Emily dumped water all over me, Jenny stuffed a bunch of ice down my shirt, I popped a few electrolyte pills, and basically got over the fact that it was hot. I more or less ran with Anna up until about mile 40 until she got this look on her face that I remember seeing the last two times I ran with her; kind of a gritty and determined I-don’t-care-what-it-takes-I’m-tearing-through-this-course-like-its-nothing sort of look. After the race she described it to me as “I just got a burst of energy”. Yeah, a 60-mile burst of energy. One of the toughest parts of The Bear 100 is the 7-mile and 3,000 foot climb from Temple Fork (mile 45) to Tony Grove Lake (mile 52). Its steep and long, and I was feeling a little bit low on energy. But, I’m proud to say not a single person passed me the rest of the race after Temple Fork. Tony Grove is a good spot to get a fresh shirt on, eat some food, and pick up a pacer for the second half. I was very relieved and excited to see me crew and get ready for the business end of the race. Also at Tony Grove I picked up Lindsay, my first pacer of the day. Lindsay paced me in the same section last year and we had a great time. 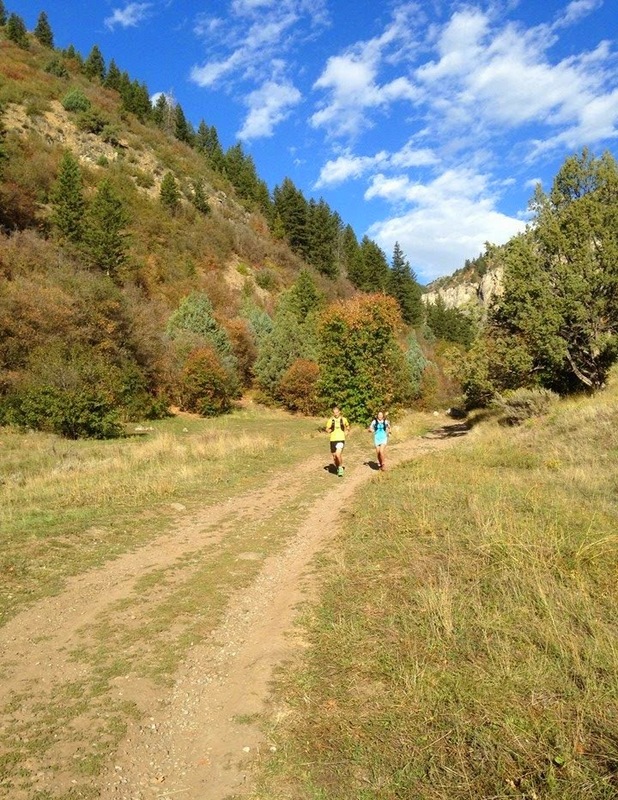 This year was no different; we ran through golden aspen with curling leaves and deep green pine forests. Next, it was my turn to run with Jenny. Those of you out there that are married and have kids know how hard it can be sometimes to do outdoor recreation (especially mountain running) with your spouse. We rarely get to together these days, so it was super fun to run with Jenny for 15 miles into the evening. As Jenny and I ran and light turned to darkness, I actually became more confident today was going to be a really good day. Enjoying a cup of tea at mile 85, I think. The last 15 miles of a hundred mile race are always going to be tough. So, I made sure I had one tough pacer for the finish. Our friend Emily is a personal trainer, nordic ski coach, and a previous finisher of The Bear 100 as well. I figured she’d get me to the finish in the fashion that I wanted. As Emily and I set off into the darkness, the unusually high temperatures of the previous day came to an end as a huge and moist weather system moved in. It rained non-stop for almost the entire final push to the finish. The terrain got sloppy and slick; we struggled to get traction on the climbs and slid almost out of control on the descents. I always have different levels of goals during these sorts of race, but my ultimate goal for this race was to run it in 22 hours. I kind of thought hoping for a 3.5 hours improvement from last year might be a little far fetched, but I thought I was up for it. As I left the final aid station at mile 92 with Emily, I knew that I would have to be really fast to get under 22 hours. We were up for the challenge, and after clawing our way up the final muddy climb, we recklessly bombed down everything that was left. Even when it was clear I wasn’t quite going to get exactly 22 hours, Emily did not relent, pushing me into a couple of sub-8 minute miles into the finish. It was pretty agonizing, but that’s what pacers are for! In the end, I finished in 22 hours and 8 minutes, which was good enough for 8th place on the day. I was absolutely thrilled. Halfway through the race I was pretty sure 22 hours was out of reach, but I decided to keep pushing on anyways. I’m proud of the dramatic improvements I’ve made from a year ago; I started 2014 off injured and worked diligently to get fitness back and then move forward. Ideas for what next year will bring are already floating around in my head… we’ll see what I come up with. There were 310 runners registered for this years race and I applaud every single one of them that toed the starting line. Taking a shot at 100 miles takes some bravery and stupidity, and I’m just so impressed at the people who fought through the endless cold and rain of Saturday to get in under the 36 hours cutoff. None of this would be possible without Jenny supporting me, tolerating all of my training, pacing, and crewing for me. I also could not have done it with out the tireless help from Emily and Lindsay; they were truly remarkable. Thanks to all of you out there who cheered me on, followed the race online, or just wished me well; your support means so much to me too. Also, congratulations to Anna Frost for winning her first ever 100 mile race and setting another new course record in the progress. Truly amazing!